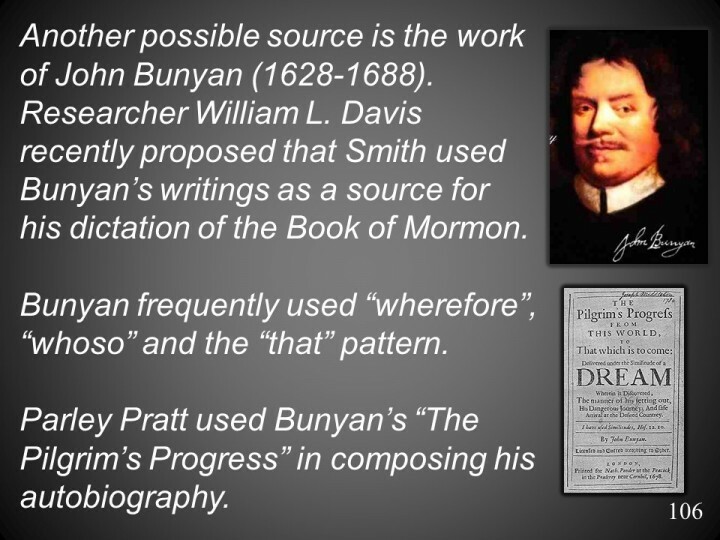 Researcher William L. Davis announced his theory that Smith was inspired by John Bunyan’s work in the LA Review of Books (October 30, 2012). (a) The original manuscript supports the hypothesis that the text was given to Joseph Smith word for word and that he could see the spelling of the names (in support of what witnesses of the translation process claimed about Joseph’s translation – namely, that he spelled out the Book of Mormon names, at least when the name first appeared). (b) The original text is much more consistent and systematic in expression than has ever been realized. (c) There are a number of errors in the text that have never been corrected in any LDS or RLDS edition, although none of them fundamentally alter the text. (d) There are occasional errors in the original manuscript itself (see, for instance, the reading “Ishmael and also his hole hole” in 1 Nephi 7:5); errors could enter the text from its very earliest transmission; many of the errors in the original manuscript show that this manuscript was written down from oral dictation. (e) Errors in the printer’s manuscript clearly show that this manuscript was produced by visual copying from another text, not by oral dictation. (f) Joseph Smith’s editing for the second and third editions (1837 and 1840) represents human editing, not a revealed revision of the text. (g) The original text includes unique kinds of expression that appear to be uncharacteristic of English in any time and place; some of these expressions are Hebraistic in nature. (h) The early transmission of the Book of Mormon text does not in general support the traditional assumptions of textual criticism – namely, the assumptions that the transmitted text tends to remove difficult readings and lengthen the text; instead, the early transmission of the Book of Mormon text tends to introduce more difficult readings and to omit words and phrases. The two instances of Early Modern English vocabulary in the KJ Bible are “to require” and “cast arrows”.